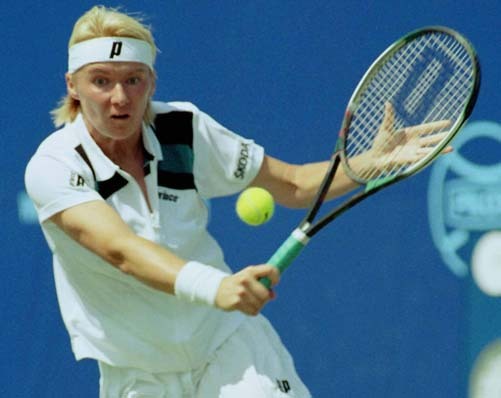 Last month's column addressed the two handed backhand, which I believe is the most common backhand stroke on both the Men�s and Women�s Tours.� I strongly advocate that newer players adopt this stroke as their normal backhand.� More seasoned players may wish to change to a two handed backhand, but usually the transition is not that easy.� Clearly, the �softwares� associated with one handed and two handed backhands are quite different. Even if you decide to adopt the two handed backhand, you will need at least one other backhand stroke:� The One Handed Backhand Slice! 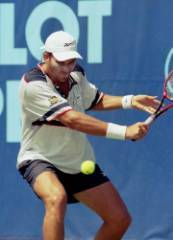 There are several reasons why every player will need to have this vital stroke.� First, there are those situations where a player is stretched to the maximum limit on her/his backhand wing.� In these situations, two handed shots just don�t have the reach, and flat or topspin one handed backhands need to be hit more in front and closer to your body. 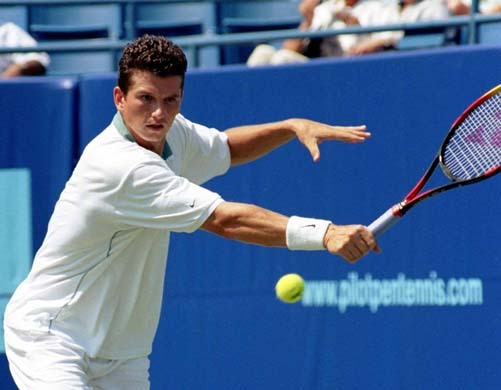 In this photo, we see Richard Krajicek hitting slice because he has been stretched wide. Second, the one handed backhand slice is a stroke that by its very nature allows a player to approach the net.� I think that the best volleyers are, in part, so good because they have great one handed slice backhands that get them to the net. 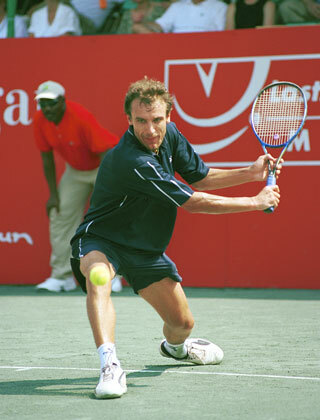 Third, the one handed backhand slice when really �chopped� (hit with a severe downward motion) can be used to hit devastating drop shots.� Even Andre Agassi, especially early on in his professional career, would use this shot effectively.� Anna Kournikova is known to drop shot opponents with skill and effectiveness. 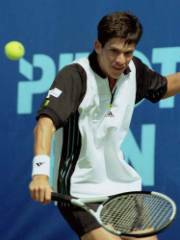 Fourth, hitting the backhand slice allows a player to change the rhythm of play by mixing in a spin that is quite the opposite of topspin.� Sometimes, players who use very severe grips on either the forehand or backhand wings (western forehand and severe eastern backhand grips) have difficulty hitting the low bouncing sliced ball.� Even if this is not the case, mixing up the spin is a good idea. Finally, the one handed backhand slice is a perfect way to hit a defensive lob.� By angling the racquet face a little upward, the player can hit slice that will keep the ball very high and deep.� These defensive lobs are absolutely essential when trying to get back into a point after being pulled wide or stretched out. 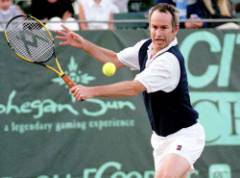 The one handed backhand slice is really quite an easy stroke to hit.� It uses our muscle groups in ways that are quite natural with respect to movement.� In fact, I find that many players who hit only one handed backhands hit all these shots as sliced shots.� Hitting flat or topspin one handed backhands is not as easy a task. 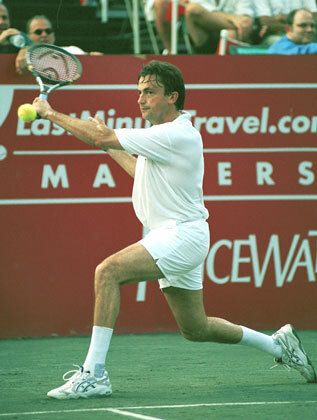 Most two handed players have adopted the one handed backhand slice as part of their arsenal of shots.� It has been said that Mats Wilander learned the one handed slice in order to be able to win Wimbledon.� Clearly, on grass surfaces or low bouncing surfaces, the one handed backhand slice is more likely to pay dividends.� Why? 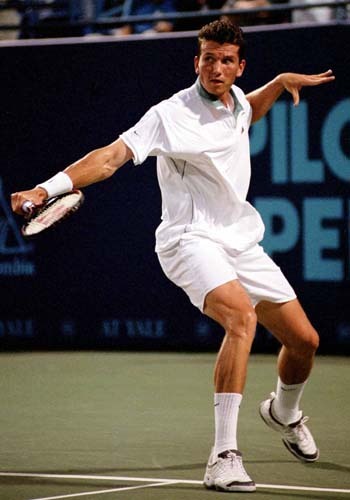 Well, as you will see the downward motion of the racquet and the open face of the racquet allow the player to easily handle the low ball without as much �lifting.�� Here, Mats gets down low to hit the backhand slice but he doesn�t have to get �under and lift� the ball. Even though Aranxta is known for her speed and endurance on the court, she at times hits the one handed backhand slice.� In this shot, she is hitting a sliced backhand to stay in a rally.� Her form is not perfect in this shot but good enough to allow her to hit safely and recover to the center of the court. To learn this stroke, we need to begin with the proper grip.� The one handed backhand slice can be hit with several different grips�the continental, the eastern forehand and the eastern backhand.� The preferred grip for the one handed backhand slice is the continental grip displayed below. The black areas on the grip represent the bevels.� The blue areas are either the sides, or the top and bottom. Since it is essentially a tighter fisted continental grip, the so-called, hammer grip is not a bad choice for the one handed backhand slice. Here is what a hammer grip looks like. Now, one can hit this slice shot using an eastern backhand grip, but one has to bend the wrist back to open the racquet face.� Using the eastern forehand grip is really not a bad option, but if you are stretched out hitting the ball, the racquet face will be so open that your ball is likely to �float� out of bounds.� Thus, for these reasons, I suggest that you only use either the continental or hammer grips. In addition, the continental and hammer grips are perfect for volleys and for serves.� If you hit a two handed backhand, you can learn to strike this two handed shot using a continental or hammer grip for your dominant hand.� In these ways, you can actually minimize the number of grips you need to know and how often you must change grips when playing a point. The next most important aspect of hitting the one handed backhand slice is the preparation. It is desirable to take the racquet back high and somewhat behind one�s back when hitting the one handed backhand slice. This stroke requires a high to low motion of the racquet to impart the backspin (slice). Here are some illustrations of pros executing what I believe is the perfect racquet �take back.�� In this photo, we see Anke Huber taking the racquet back well above the ball height and almost behind her back. 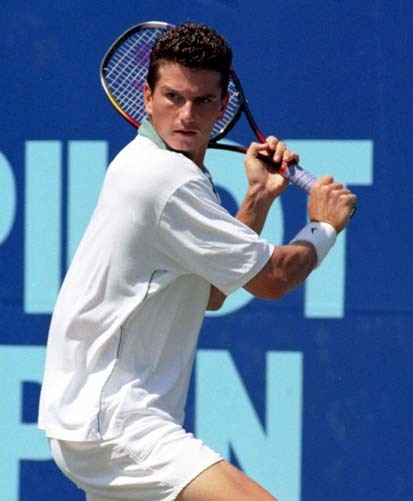 Again, we see Richard Krajicek.� Notice how high he takes back his racquet. The backswing on these one handed slice shots is different than any other stroke in tennis. Why?� Well to impart backspin (slice) you must move from high to low in striking the ball.� Flat and topspin strokes require an opposite, low to high action.� Volleys should have little or no backswing, and are more of a �level� shot. 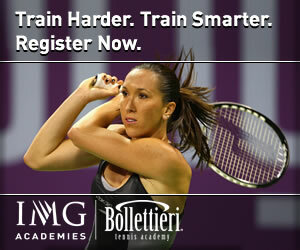 Play better tennis with TennisMindGame! 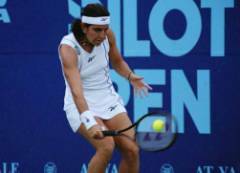 Next, we have to address stance.� One handed backhand slice shots require that the player use a closed stance.� This is of critical importance!� Many times errant shots that were hit as one handed backhand slice efforts go awry because the player was too open in her/his stance.� Now, no one can always be in perfect position to hit any stroke. So, there are times when a player will want to hit slice but be in the wrong stance.� Well, give it a shot, but do not be surprised if the shot is not controllable.� In these situations, I have trained myself to hit slice shots at about half pace.� In this way, I can be reasonably certain that my ball will not float out. In addition to using a closed stance, notice that in most of these pictures, the players are leaning forward into the shot when making contact.� This is what gives the backhand slice its power and bite.� If you are leaning backward when hitting the one handed backhand slice, you are probably going to hit a high, low paced shot that will come back at you as a winner!� If you are going to the net after hitting the one handed slice, you will automatically find yourself leaning into the shot.� When I coach players, I often times tell them to take a step into the court when hitting the one handed slice to help them get used to leaning forward at the moment of impact. In the shot below, notice how Jana Novotna leans into the shot as she prepares to make contact.� Knowing her game, it is no surprise that she will often times rush to the net after hitting the backhand slice, as she did after striking this ball. The last element that we need to address is the stroke finish. One handed backhand slice shots should finish with the racquet going forward and upward�not sideways across your body.� The non-dominant hand and arm should be moving backwards away from the ball as you make contact with it.� I often use the cue �spread you wings� to students and players when they hit the one handed backhand slice.� By moving your hands and arms in this way, you provide your body with balance, and you help the timing of your shot. In the shot below, I would like to see Richard spread his left arm and hand out further from his body in this stroke finish�but he is still moving them apart. Tim Henman hits some of the most beautiful slice since Michael Stich.� Even when he is hitting slice higher and deeper, as in the shot below, he still finishes with his left hand and arm moving away from his body. Use a continental or hammer grip for backhand slice. Take the racquet back high and somewhat behind your back in preparing to this the one handed slice. Remember, it is a high to low stroke motion. If possible, hit the one handed slice from a closed or severely closed stance. Lean into the shot at the moment of impact. Finish with the racquet moving forward and upward. Make certain that the non-dominant hand and arm are moving away from your body as you finish the shot.